This exhibition celebrates the creation of the Library’s newest digital collection. The McGill Library’s Chapbook Collection contains over 900 English-language chapbooks published in England, Scotland, Ireland and the northeastern United States. Through a generous donation from the Harold Crabtree Foundation digital facsimiles have been prepared and the entire collection is now online. The majority of the chapbooks in the McGill Library’s Chapbook Collection were published in the early 19th century. They contain stories based upon medieval romance, English legends and folklore, or abridged from popular literature for adults. 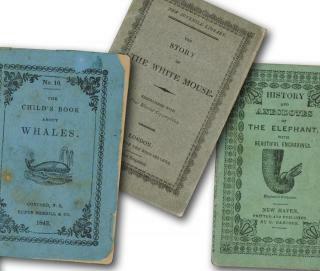 Children’s chapbooks of popular nursery rhymes, fairy tales and books of instruction are also part of the chapbook collection courtesy of The Sheila R. Bourke Collection of Children’s Literature, a major research collection in children’s literature which is held by the Library. Chapbooks are small in size and number of pages. They were printed on cheap paper and their leaves stitched together, sometimes including an illustrated paper cover. Often undated, without authors, chapbooks are usually identified by their printer and often contain numerous woodcut illustrations. They were carried by peddlers known as “chapmen” and were sold for pennies or less to the rural population on their trade routes. 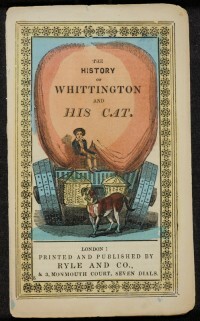 Scholars link the proliferation of this “cheap print “ to increased literacy rates and though first-hand accounts of readership are rare, chapbooks are considered a significant aspect of the printed popular literature of the time. These selections from McGill Library’s Chapbook Collection illustrate a range of subject genres, printers and publishing locations on both sides of the Atlantic. Included are evangelical publications such as Hannah More’s Cheap Repository Tracts and the Religious Tract Society who modeled their publications on the chapbook format in an attempted to reform the lower classes. The McGill Library’s Chapbook Collection can be viewed online from the McGill Library website at http://digital.library.mcgill.ca/chapbooks. Items displayed in this exhibition have been selected from McGill’s Rare Books and Special Collections including The Sheila R. Bourke Collection of Children’s Literature and the Children’s Collection. This exhibition was prepared by Sharon Rankin, Liaison Librarian. The Library would like to thank Jason Grand, McGill M.A. English 2014 for the excerpts of his texts used in this exhibition. Free admission. Accessible during opening hours.